My initial reaction, on reading the WSJ story, was exactly the same. But then I thought it might be worth reading the report itself. Finding the report (which you can download in PDF format here) wasn’t easy, since Chung evidently decided that everything we needed to know about the report was contained in her article, and that therefore there was no need to link to it. And if you go to the Citi Prime Finance website, the most recent report there is dated December 2010. But Citi’s crack PR team did send me their press release, which includes a link to the report. And it turns out that the $5 trillion number is taken straight from the headline of the press release; it doesn’t actually appear anywhere in the report at all. In that sense, this is a replay of the Kauffman report on hedge funds a couple of weeks ago: it’s a very worthwhile report, undermined by a stupid press release desperately trying to sensationalize something quite subtle and interesting. 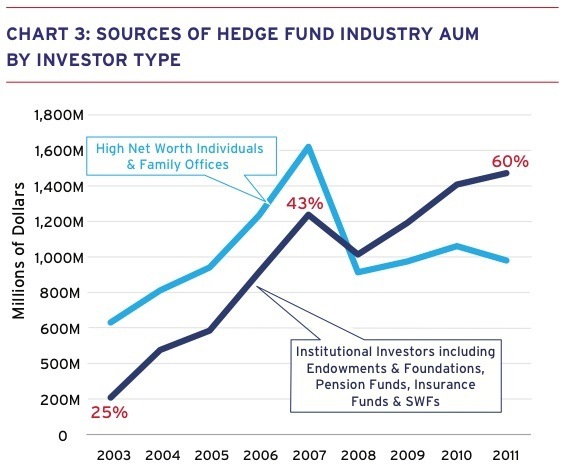 As you can see, individuals and families are basically keeping the amount of money that they invest in hedge funds flat, even after returns, and despite the fact that they have gotten a lot wealthier over the past three years. As a percentage of their total assets, the amount of money these people are investing in hedge funds is definitely falling. On the other hand, institutional investors are still increasing the amount of money they’re allocating to hedge funds. Not quite as quickly as during the go-go years of 2004-7, when institutions poured $1 trillion into the asset class. But Citi estimates that institutions transferred some $179 billion in total into hedge funds in 2010 and 2011, even as they were recovering from the financial crisis. And I’d agree with Citi here that at the margin institutional investors are more likely to accelerate those flows than they are to reverse them and start withdrawing money. Big institutional investors move slowly, and once they start on a course of action they tend to be committed to it for the long term. Institutional investors entering the market were looking for risk-adjusted returns and an ability to reduce the volatility of their portfolios. This was a very different mandate from the one sought by high net worth and family office investors— namely, achieving outperformance and high returns on what they considered to be their risk capital. We only take money from institutional investors and the minimum investment levels are high (passive $50 million, bespoke $500 million). This is due to only wanting “like-minded” investors to be part of the platform in order to reduce the risk of excessive withdrawals by less stable/less long-term investors in case of a market crisis of some sort. This is the new world of hedge-fund management: setting minimum investment levels so as to deliberately exclude precisely the kind of investors that built up the asset class in the first place. The number of people who can do that, however, is by its nature much smaller than the number of people who have founded a hedge fund. So consolidation and contraction is inevitable. While the Citi report does forecast an increase in the amount of assets under management, it doesn’t for a minute forecast an increase in the number of hedge-fund managers. “It is not a particularly great time to be a fund manager,” says Barry, and he’s right. But that doesn’t mean that Citi is wrong. As many investment committees and boards became uncomfortable with the fees they were paying to fund of funds, many institutional investors began making direct allocations to hedge funds. 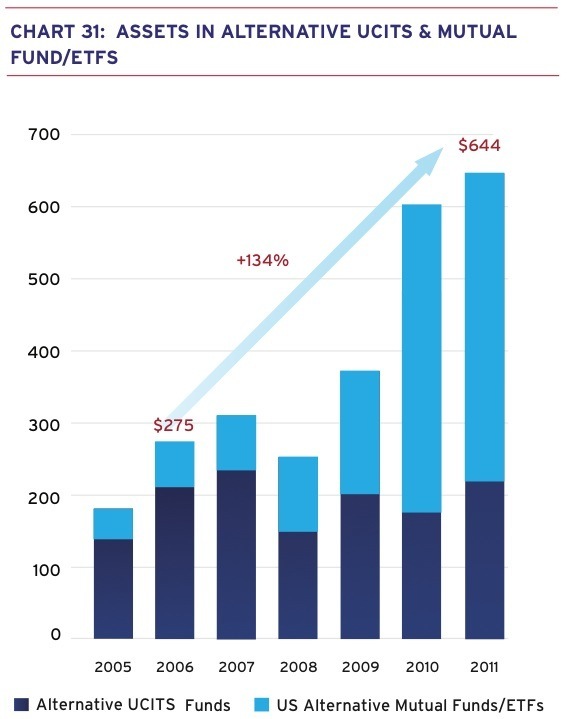 Many of these investors began their direct investing program by again placing a singular allocation with a multi-strategy manager and relying on the CIO of that organization to direct capital across various approaches based on their assessment of market opportunities. 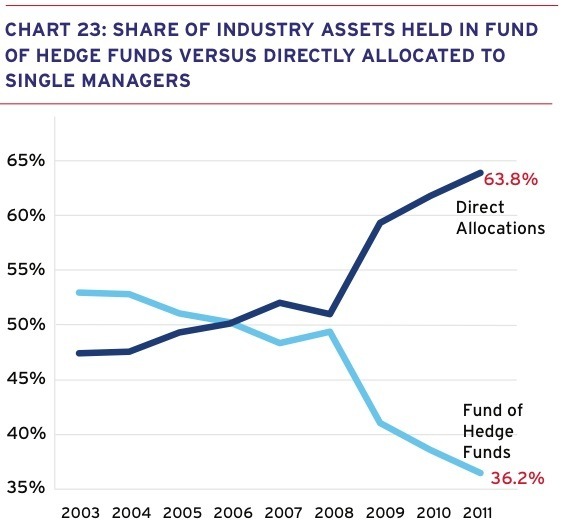 Essentially, as the hedge-fund world consolidates, the functions formerly performed by fund-of-funds managers can now be performed within huge hedge-fund groups. And they won’t charge you extra for the privilege. Finally, Barry says that investors are getting fed up with high fees — and the question of 2-and-20 is one which is surprisingly ducked by Citi in this otherwise comprehensive 76-page report. While sophisticated risk-allocation strategies are all well and good, at some point one has to ask whether it’s worth paying 2-and-20 to get the level of risk you want, and whether you might not be better off over the long term with less risk optimization and also lower fees. If the hedge fund industry doesn’t grow as much as Citi says it will, the reason will surely be that institutional investors will finally have decided that 2-and-20 is too high a price to pay for what they’re getting. Remember, most institutional investors are focused obsessively on capital protection, as they have limited pools of assets they are managing to meet obligations. For pension funds, these obligations relate to the institution’s need to meet liabilities owed to their members. E and Fs need to fund activities over a long-term period. Sovereign wealth funds need to diversify their account balances. In all these instances, there is an extreme aversion to losing money. “E and Fs”, by the way, is investments for “endowments and foundations”. And this passage just doesn’t ring true to me. Bond investors focus obsessively on capital protection; long-term institutional investors looking to capture an illiquidity premium, on the other hand, actively want more volatility, if it means that their long-term returns will be higher. If the institutional investors that Citi talked to are focusing on capital protection, I find it hard to believe that they’re going to significantly increase their allocation to hedge funds. Partly because of those fees, and partly because no hedge fund is immune to blowing up. It’s true that hedge funds as a whole lost less money than the stock market did during the plunge of 2008-9. But they still lost money — if they were promising capital protection (something the stock market never promises), then they clearly failed at their job. Another thing missing from the report is the move from defined-benefit pensions, which create massive pension funds, to defined-contribution 401(k)s and the like, which just create lots of much smaller investors. The sophisticated strategies outlined in this report are all well and good, but they’re out of reach to anybody with a 401(k). As the report notes, the US accounts for 58.5% of all pension fund assets. And if those assets move out of pension funds and into 401(k)s, then they’re significantly less likely to get invested in a hedge fund. Several respondents noted that these products were only suitable for strategies using highly liquid products. There were also concerns that these products would not get the same attention and focus from hedge fund managers as their core funds, since the fee potential was not as great. Many worried that managers would just view these products as an opportunity for asset gathering and that their lack of performance could hurt the brand of the hedge fund industry overall. 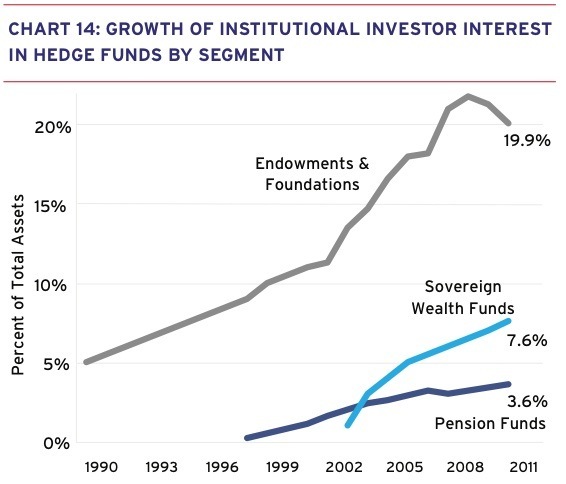 Pension funds, here, are by far the largest pool of money; sovereign wealth funds are smaller, and endowments and foundations are smaller still. Basically, the larger the amount of money you’re managing, the smaller the percentage of that money that you’re investing in hedge funds. Over time, I suspect that these three lines are likely to start converging — somewhere. And if the convergence point is anywhere north of about 4%, then the total amount of money in hedge funds will go up, just because pension funds are so big. In order for the hedge fund industry’s assets under management to fall, the blue lines in this chart are going to have to stop rising and start falling. And while that’s possible, I don’t think it’s going to happen. Not yet. So will hedge funds find themselves managing $5 trillion by 2016? No. But will they be managing more money than they are today? Yes, I think they will. And the increase won’t just come from internal returns. It will come from substantial capital inflows, too.